Light: Becoming or seeking out a guru. Going on a retreat. Recharging spiritual or creative batteries. Lighting the way for those with less experience. Stepping back to gain perspective. Shadow: Being a loner. Fearing contact with others. Becoming a know-it-all. Inflating claims of expertise. Hiding your skills and talents out of fear of unworthiness. Mythical/Spiritual: The Christ, while fasting 40 days in the wilderness. Chronos, the god of time. Father Time. Hermes. Story: On the verge of giving up, the main character withdraws, seeking clarity in isolation. He or she may receive advice from a wise person. Relationships. Don’t be afraid of being alone. Even the closest companions need some time apart. Being involved in a partnership does not eliminate your need to be your own person. To better please others, first learn how to please yourself. Work. Sometimes, you have to close the door, forward calls to voice mail, and shut down your email client to get things done. Demand the space and time you need to get your assignment done. If you’re overwhelmed, consider bringing in a consultant or an experienced aid. Spirituality. Learn to be still. Doing so is a challenge in today’s hurly-burly world, but the skill offers many benefits. Focus on meditation; condition yourself to slow your thoughts and lower your blood pressure with a few measured breaths. Daily practice will make a huge difference in the quality of your life. Personal Growth. To be the best you can be, you must know who you really are. Reject the definitions others project on you. Search within. What do you really value? What do you really want to achieve? Empower yourself by embracing yourself, warts and all. Fortune Telling. A period of loneliness begins. One partner in a relationship departs. A search for love or money proves fruitless. The raised lantern. A raised lantern has long suggested knowledge: “Thy word is a lamp unto my feet and a light unto my path.” Here, the lantern shows the way to higher knowledge. What information do you need to bring to light today? The Star of David. This hexagram is a symbol of Judaism and is also called the Seal of Solomon. It combines the symbols for water and fire, suggesting the union of male and female energies. How might faith unify those involved in your situation? The staff. This incarnation of the scepter suggests a different use of power, recalling the staff of Moses. Instead of symbolizing power or intention, it facilitates progress. What support do you need today? The remote setting. The work of the Hermit requires isolation; he is usually drawn in a remote locale, emphasizing themes of withdrawal. What might happen if everyone in your situation backed off a bit? The robes. 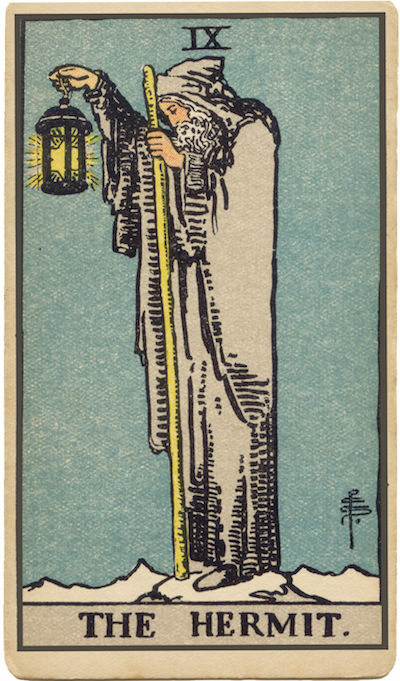 The robes suggest the Hermit’s status as an initiate or member of an esoteric order. Are you a member of a group that could prove helpful now? What would happen if I simply withdrew and took no action? How can I get some perspective on the situation? Who has walked this path before me? How can I enlist his or her help?